At the Corner of First Street and Church Avenue, under the live oaks of First United Methodist Church of Long Beach. Want to know where you can get fresh, local produce here on the Coast? Click here to see a listing of Farmers Markets from http://www.gulfcoast.org/. The 37th annual Peter Anderson Arts & Crafts Festival will be held November 7 and 8 in its usual location of the streets of Ocean Springs, under a canopy of beautiful trees dressed in their finest fall colors and surrounded by over 150 shops and 400 booths. Last year over 150,000 people visited the shops and booths that were showcasing all shades of art, jewelry, clothing, and crafts geared to young and old alike. Food, music, meeting old friends and new, there is plenty for all to see. Hours of the Festival are 9 am-5 pm each day. For full schedule and events, follow the above link or call 228.875.4424. The 15th Annual Gulf Coast Veterans Day Parade will be held on Saturday, November 7, at 11 am in downtown Gulfport. Following the parade, The Red White & Blue in the Park Festival is open from 10am-5pm in Jones Park. There will be musical entertainment, food vendors, arts/crafts and food vendors. 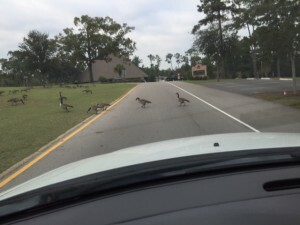 A frequent and well-loved sight in Diamondhead is that of the ducks and geese meandering across the road, stopping traffic in both directions, checking out whatever is on the other side. Most are either on their way north or south and have stopped for a “layover” in Diamondhead for a bit of a rest. These feathered friends can be found at various times gathered around the churches, the Community Center, City Hall, or all around the duck pond, munching on the goodies they find in the well-groomed grasses and shrubs. Feeding the ducks is a favorite past time for residents, especially young children, and you will frequently see folks stopped, with the ducks and geese gathered all around them, clamoring for their fair or not-so-fair share of the bread and sometimes corn being handed out. Occasionally, one of the birds will be injured somehow–maybe by another bird or other animal, rarely by an automobile. Such was the case several years ago. In passing the Duck Pond on several occasions during the same day, I noticed a goose that stayed on the ground in the same spot all day, which is highly unusual. Curious, I stopped to investigate and found the goose had an injured foot and could move about only minimally, just enough to get into the water for safe keeping at night. I started going by every day, feeding him, and having to outsmart the rest of the flock to do so. This worked well until I went out of town for a couple of weeks and enlisted the help of some friends to care for “Goosey Goose”. One of my friends was very close to a local vet and shared Goosey’s story with her. Well, the upshot was that, by the time I returned to Diamondhead, the vet had very carefully rescued Goosey, repaired his mangled foot as best could be done, and had taken him to live out his days in luxury on her farm. Many thanks to the kind vet! So, if you are in the area, stop by the Duck Pond in Diamondhead. There is a shaded deck in addition to picnic tables. 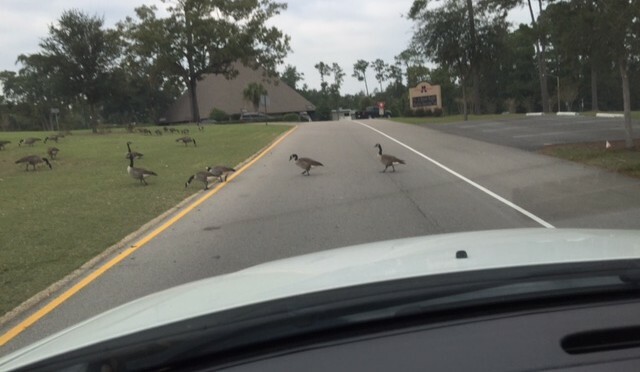 You might get lucky and see a rare “traffic backup” of four cars in both directions, patiently waiting for the ducks and geese to amble across the street! 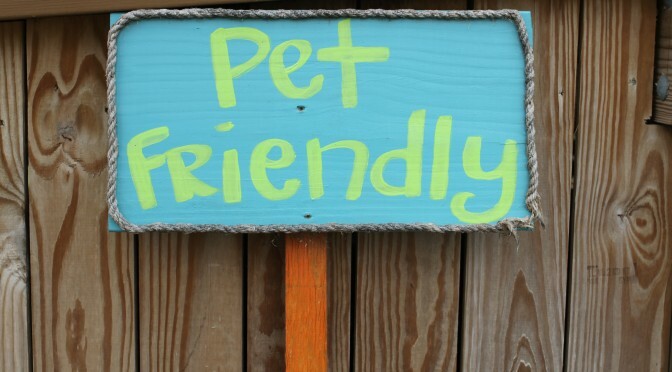 Do you like to travel with your pet? 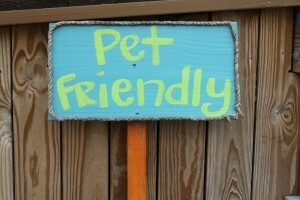 Or enjoy your pet’s company at mealtime? But then hate to leave the little (or large) fellow at home or in your room when you go out to enjoy the restaurants on the Gulf Coast of Mississippi? Well, you don’t have to look into those sorrowful, soulful eyes and tell him/her to “Stay!” any longer! 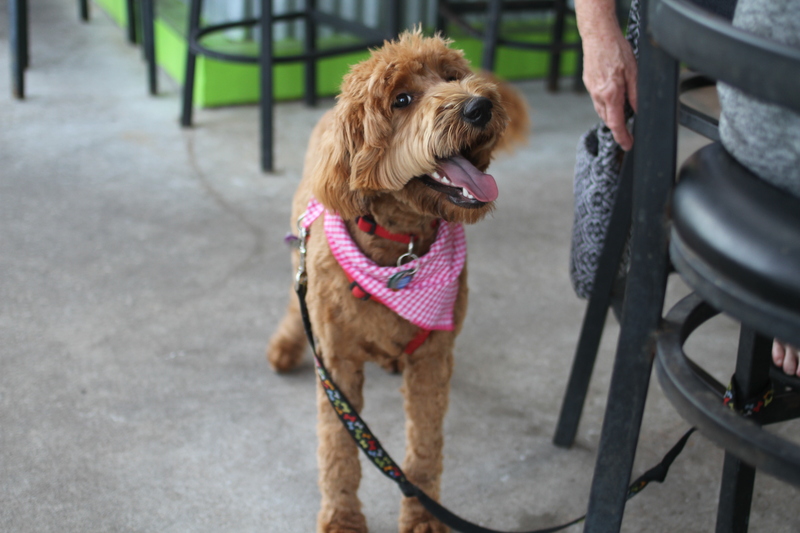 Here is a short list of pet-friendly restaurants locally! Recommended that you call in advance to confirm outdoor seating. Fido should always observe his/her inside voice and not bark to disturb other diners.